TAG Sessions has had quite a ride this 2017. There have been ups and downs, but thankfully, the ups have been far more memorable and exciting. 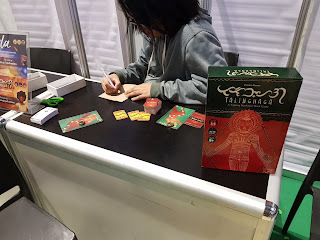 Among the highlights of this year include being part of the Cold Shadows kickstarter release, the Dreamchasers, and becoming part of the Gallant Knight Games family. 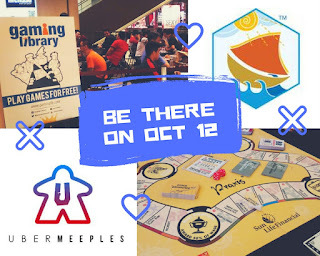 I also got opportunities to share my gaming knowledge, from giving talks at the Global Game Jam 2017, the Uber Meeples game event, and others. I found the chance to meet my good friends and gaming idols after being invited to the Strategicon event, Gamex 2017, in Los Angeles at a special guest. While there, I had the lovely opportunity to meet with awesome friends and gaming greats, Ben Woerner, Dan Waszkiewicz, Dustin DePenning, Stephanie Bryant, and the incredible jim pinto. 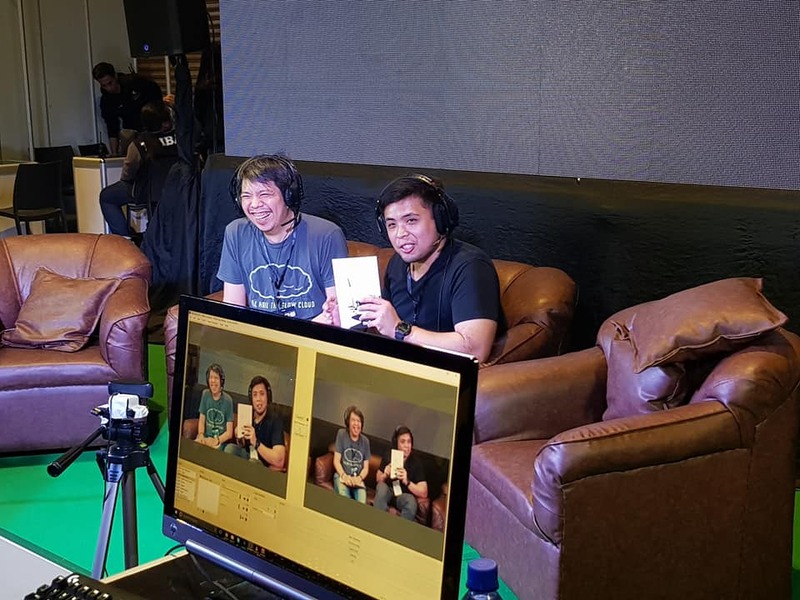 It was like a gaming retreat from the world, spending three days hanging out with them and having the chance to run games for gamers who attended. Had a few featured moments as well this year, from being interviewed by IdeateTV, and featured in a few articles by GMA News, thanks to my two memorable award-related moments: A Single Moment actually was the runner-up for the Indie Ground Breaker's Best System award for 2017, and for being part of the remarkable 7th Sea: Pirate Nations book, which won a Silver ENnie this 2017. Oh my gosh. Who would have thought that was even possible? I also was able to connect with a lot of the local game designers thanks to being invited to the Electronic Sports and Game Summit by James and Gwen. 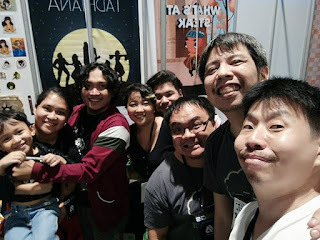 I'm terribly lucky to have met these other creative forces. I hope we help leave a legacy of awesome games for more Filipinos to enjoy in the coming years. And yes, jim pinto, clearly your influence can be seen on this list! I also started TAG Bites, completely free one-shot open table game sessions which Rocky and I have opted to hold to help open the opportunities for more local gamers to try systems they may have not tried before. Started last July 2017, I've so far run the following games for a host of different players. 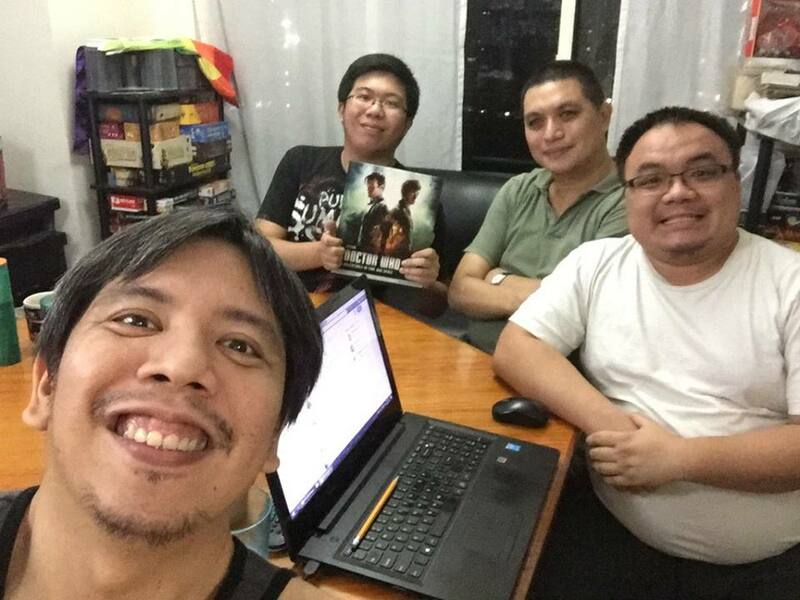 July had a 7th Sea: Second Edition game and a postworld games' Praxis: Black Monk game. August had us playing Doctor Who: Adventures in Time and Space and Blades in the Dark. 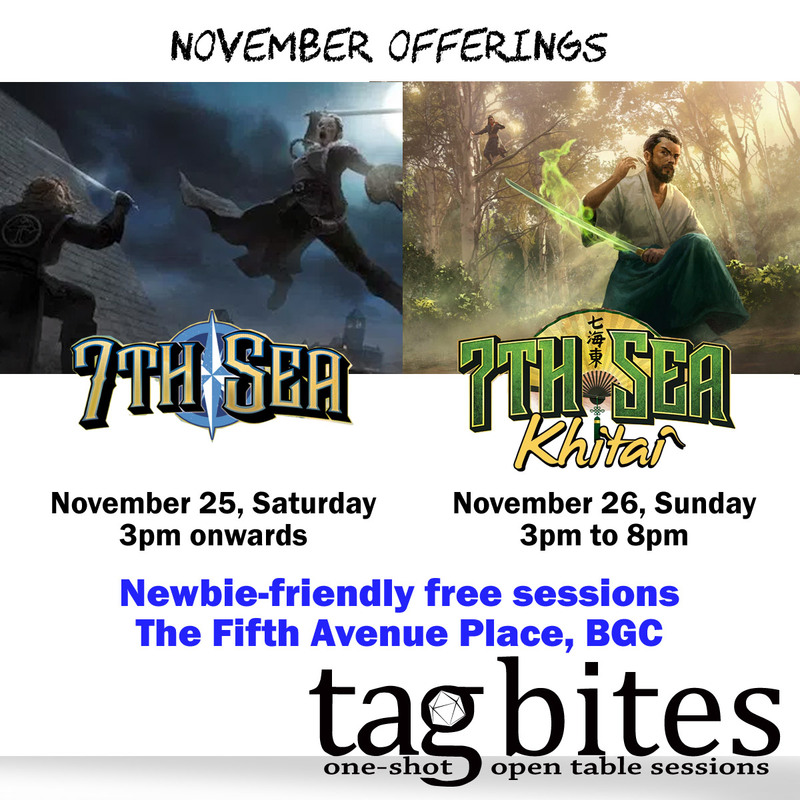 November had us playing 7th Sea: Kithai, and 7th Sea: Second Edition - Pirate Nations. As always, the games will be completely free and players will have an opportunity to play a game which probably will be unlike anything they ever experienced before. Wrapped up a number of game campaigns this year. 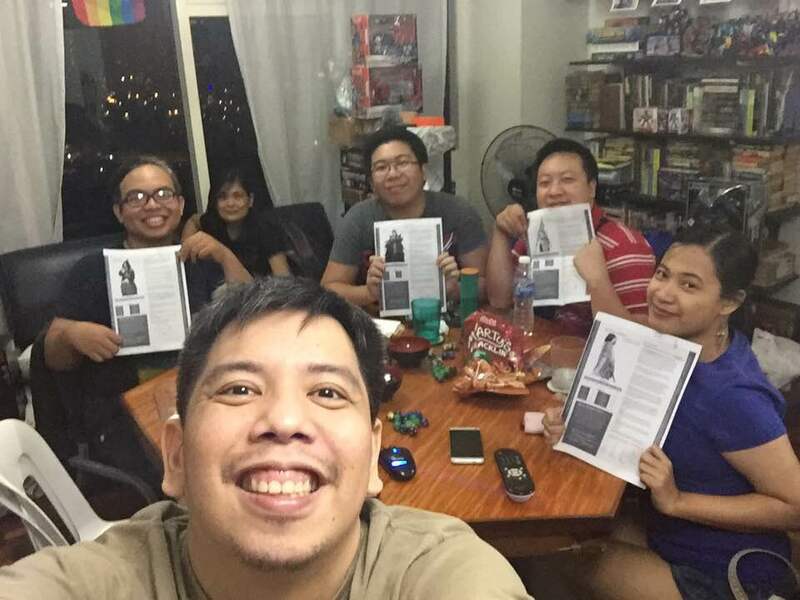 We gave closure to the young superhero game which we rebooted as the Millennials game using the DC Heroes system. 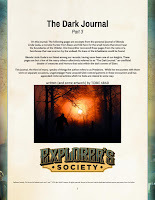 We also wrapped up the Houses of the Blooded game, Thrice Damned, and sadly cancelled the World of Darkness Vampire campaign, Sleeper, due to reasons. The currently ongoing campaigns this year include the ongoing duo 7th Sea Campaign, The Nisab Diary and Alas, Such Fates, which has reached the third act of the narrative called The Guissola. The story continues to be incredibly awesome with Rocky, Flip, Aina, Brian, Josh, James, and Che as the Heroes who have uncovered the machinations of the Novus Ordo Mundi and the invaders from Earth. 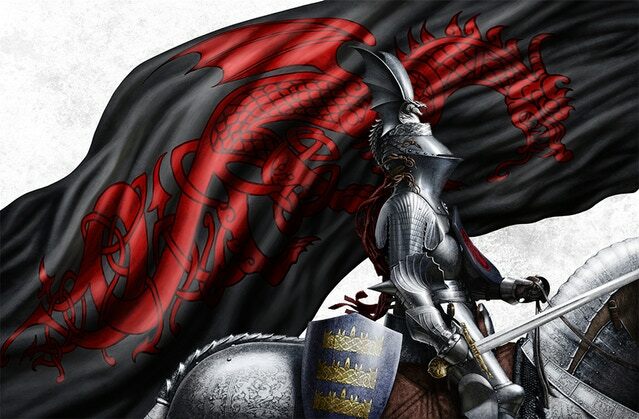 In addition, we're a few sessions in after having found the courage to jump in to play The Great Pendragon campaign! Rocky, Flip, Urim and Adrian are the knights known as the Brotherhood of the Bear. Their stories have lead to King Uther's meeting with Ygraine and it is only a matter of time to see where the stories go next. Also now playing as a player in Flip's 7th Sea campaign, The Widow's Nest, which has me as a former Inquisitor turned rough apprehensive adventurer. This year, we're looking at a lot of possible projects. A Second Moment continues its slow rewrite. I will admit a large part of its delay was due to recovering from the events that transpired in the earlier part of the year. The same goes to TAG Sessions, Volume 1. Both are now needing extensive rewrites. With our move to BGC, I've discovered there's a lot more time to write nowadays since we do not need to wade through two-hour traffic each day. Our place is now called Sietch Vicis and interestingly more change has come this year. 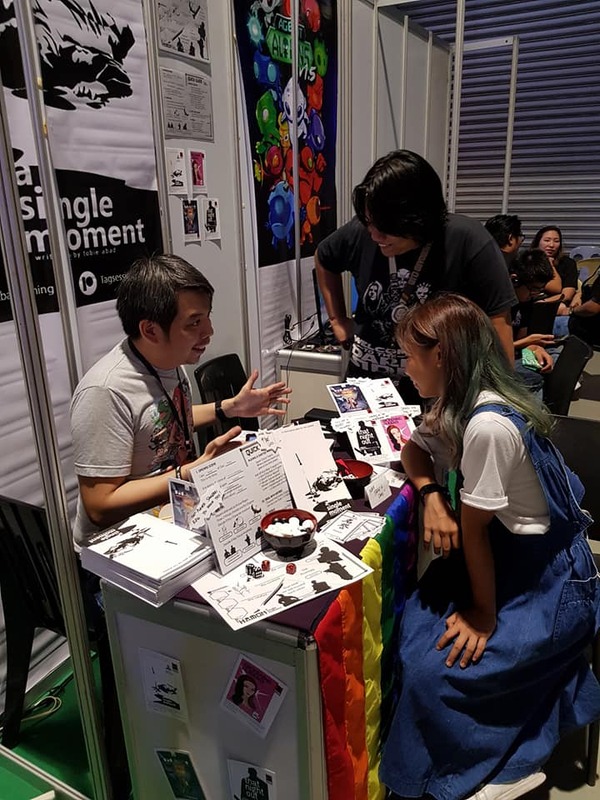 Firstly, I resigned from my day job as a full-time Game Designer at Indigo Entertainment, Philippines. After working there for over five years, I've decided to try devoting much more time to making TAG Sessions a more productive and active line. Secondly, I've got a few talks mapped out in the future. I've been tapped to give a few talks for a number of events, and it always feel nice to be able to share my knowledge and information with others who may share or even have a greater passion for gaming than I do. Finally, targeting something big this year. Hoping to have a fantastic moment happen this 2018 and I do hope it comes to pass. All that I need to do is make it happen and finish writing. I'm scared if it will work out and I am terribly freaked out if people will like it, but I realize sometimes things will only happen if you take a chance. I took a chance years ago, when I messaged Josh Jordan about wanting to write for his Kickstarter game. I took another chance when I agreed to write for Ben Woerner and for Alan Bahr. Scary as it may be to take chances, one has to learn to really shut down every horrible voice in one's head and focus instead on the passion that fuels one's work. I trusted in people I shouldn't have, and upon reflection, I learned the hard way that sometimes people you think will help you are simply out to make money or fame from your reputation and work. So yeah, thank you 2017 for the learning and the education. Thank you for the awesome moments and the appreciative new friends. Thank you for the opportunities, the mistakes, and the evolution. Working on a Wuxia game that will be Powered by the Apocalypse, a young-audience role-playing game called Dreamscrapers, a Studio Ghibli-inspired game that can even be played alone, and of course, A Second Moment and TAG Sessions, Volume one. Admittedly, the Wuxia game showed up out of nowhere, and delayed the development of both Muses, the Legacy RPG game, and mem:RE spy game. This 2018, I'm taking another chance. Maybe it will be my Second Moment, indeed. 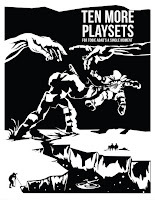 Ten More Playsets introduces ten new settings/genres for your A Single Moment games. Creation Gods who seek to determine the fate of Creation itself. Gladiators Warriors seeking Glory and Freedom. Pilots determined to find Victory. The eye for the Story. The grit for the Scoop. A worthy enterprise. An unexpected discovery. Professional Wrestling For the belt. For the Title. Political battles for power and greed. Wuxia Warriors Heroes seeking enlightenment and peace. Will the Killer or the Detective win this battle of wits and intelligence? Interested in trying any of these games? 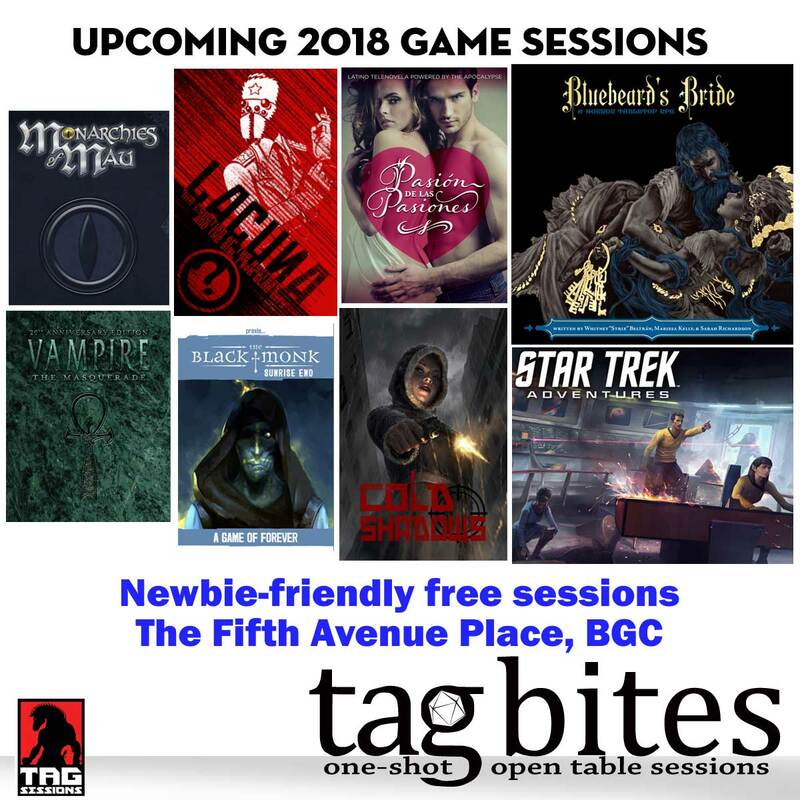 Try joining a TAG Bites session this coming 2018. Completely free. And absolutely worth your time. Learn more about TAG Bites here. For TAG Bites, I ran another session of Doctor Who's Adventures in Time and Space. Two players new to the system got to try it with me and Rocky and since I love approaching games in a theatric way, I decided to try coming up with another Dr Who session that felt like an actual episode. Sadly, there were some players who couldn't make it at the last minute, so I was forced to make adjustments to the story I had in mind. Adrian plays Penelore Mount Batton, an ingenious man from the modern day with an Insatiable Curiosity, and an almost idealistic Code of Conduct to ease those in pain and never allow others harm. He has Resourceful Pockets, a perfect Sense of Direction, and an incredible Photographic Memory. Daniel plays John Murray, an ingenious and strong man from the 30th Century. Always dressed in the 80s/70s rock era, John tends to be Impulsive, Brave, Tough and a skilled Boffin who knows the knack of Percussive Maintenance. Rocky plays Jonathan Blackwood, a reporter from the 41st Century who is Technically Inept, Argumentative, and Wanted for having less than pleasant articles about companies before. He has an Insatiable Curiosity, somewhat Arrogant, but has Psychic ability, knows how to Run for your Life and has a Face in the Crowd. The game opens with John Murray waking up at what seems to be a building's edge. As he tries to grasp better what has happened around him, he realizes the buildings are not just buildings but towers that are in space. As he tries to understand what happened, given the dead bodies all around him, he hears mechanical voices addressing him to relax and not be concerned. The robots that appear close in on him. Hidden nearby, Jonathan Blackwood watches as something happens that he cannot quite explain right now. He tries to avoid making any sound as he watches in horror. Pelenore is at his library when he sees a figure making its way into the private collection of books. He catches sight of some intruders in the private section of the library and confronts them, only to find a woman and a man grabbing books and hurrying through an unfamiliar door. Taking chase, Pelenore discovers he's in a place that is impossibly larger and that they're heading across time and space to deal with something called Dandy. The woman, eccentric and dressed in black, calls herself Doctor Who, and refers to the others as Thing #1 and Thing #2. When asked what she's trying to do, she explains they're going to rescue the other Doctor. She asks Pelenore to join them as another "bodybag" would always be good. They admit they needed a quick stop here in this time to know what they were facing, and for some reason Uber was the closest thing. The book they took is about how Uber works. Jonathan stops Murray from jumping off the building's edge, as he seems to be lost in his thoughts for a moment. He doesn't seem to remember why he was there, and in that brief moment they touch, Jonathan's psychic link seems to have broken Murray free from whatever was controlling him. Worse, Jonathan has learned Murray is a full millennium away from his proper time. Murray stumbles into an elevator. Jonathan hurries into the elevator after him but gets onto a different one. He steps into the elevator and using the AI assistant on the screens, tries to track where Murray has gone. In Murray's elevator, a door opens and he sees a young girl in a sports jacket shoved into the elevator to check for traps. 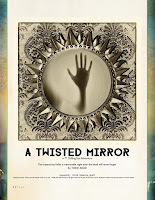 Behind her, a woman in a dark victorian outfit follows... and an older man follows them both. The young girl identifies herself as Nina, despite the woman in the dark outfit calling her Thing #1 and the old man Thing #2. She then tells Murray she is Doctor Who and asks if he would like to be Thing #3. The wall assistant asks Murray if he would like a friend, who is inquiring for his location, to join their position. Murray sees in his mind, Jonathan Blackwood - Journalist: Hard Target. Murray agrees. Doctor Who tells Murray he has a very cozy home. "Almost like a prison." Nina explains the Doctor is the reason they're here and the woman isn't really Doctor Who. The other elevator joins them and Jonathan steps into the chamber, meeting them all. Pelenore again explains they are all not her things. Jonathan asks about the Dandy Corporation and Doctor Who explains they went back to the bookstore to find information on a company called UBER to better understand the Dandy Corporation. Flashbacks of Murray meeting with the Dandy Corporation and being offered an chance to experience things first hand. He steps into the car and joins them to learn more. He meets Miss Shepherd and learns he's perfect for the services they plan to offer. It becomes clear that the Dandy company is a futuristic company that practices Live Sharing. People can basically be part of Dandy as "Actors" and are given a device that allows "Riders" to ride along them and watch their lives unfold. The heroes also learn that the company uses a multitude of golden micromachines that move in concert and gather into Dandy Lions, their security measures. But there is a darker side to the story it seems. People have been having lost memories. Some unexplained deaths as well. And worse, some of the "darker tastes" have been part of the Dandy menu of experiences to try for a price. They learn there are these tiny sequins, which seem to be attached to the skin. Detaching it with the sonics, it causes the sequin to separate and unfurl into a ball-shaped device of glittering parts. Nina screams as they reach the ground floor. A golden lion stares at them as they exit, having detected their tampering of the device. Missy grins, "A Dandy Lion!" People are staring at them as the floating devices come close, demanding they surrender to be processed. Missy surrenders, claiming to have been caught red-handed. Pelenore grabs Nina's hand and they start running. The others run off following them. Missy grins, "I guess I worked alone." The rest of the group keeps running, ducking into different places to hide in. Jonathan blends into the crowd. The others break off, running elsewhere. The security bots fail to track Jonathan, and he bumps into a cat in robes who recognizes and thanks Jonathan for his article on the adipose slavery. He is invited to a nearby tea room to talk, and knowing it helps him hide, he agrees. The others rush to the nearest elevator and duck inside. They end up back in the Dandy offices and learn more about the services the company offers. The groups learn more of the far reach of the Dandy, and son even learn that the actual Doctor, an old man in this timeline, has also trying to find a way to deal with the issue while searching for his companion, Missy. Jonathan meets the Doctor and decides to stick with him. 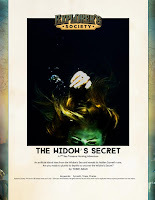 The group soon learns that the person behind this insidious company turns out to be an old face, Mistress Shepherd, who was once known as the Mistress Cordelia, a relative of Matron Cofelia of the Five Straighten Classabindi Nursery Fleet. Similar to her attempt to monetize the adipose, this time, she has attempted to utilize memories and life sharing as a means to take over people. Realizing they are on the Transmat Towers, 12 towers that surround a replica earth, Pelenore and Murray, with Nina iwth them, at one point are in a transport and on the verge of being captured. But they realize if they allow themselves to be captured, they can much quicker get back to the Doctor and the others. They decide to figure out how to escape when they get to that point. Shepherd confronts them, eager to know where Missy has gone. Shepherd admits she knows Missy is not the same as the Doctor. But she wants to know where Doctor Who is hiding. The guards in the room are adipose, well, they were but these are six-foot tall and buff with muscles. Adipose-guards? Pelenore admits they were hoping by being captured, they would be lead to her. Shepherd pulls out three starter kits for the Dandy and admits they don't need to ask. They can just find the answers in their brain. Jonathan, the reporter, has been moving around with the Doctor, and have eventually reached the office of Shepherd. Seeing the situation, the Doctor, an old man, asks Jonathan if he has cybernetics, hidden alien powers, or anything to fight and save the day. Jonathan stresses he just writes stories. The Doctor tells him to see what he can find anything useful in the window while he checks the other room. By the circular window, Jonathan sees the interior of the office and the hostage situation, then past the group, he sees Missy at the window opposite the door, staring back at him. Missy, floating outside the window, begins to mime at Jonathan, to do something about the events happening in the room. An echo of the Donna Noble - Doctor scene in the past, also with Corelia, the two embarrassingly mime communication at each other, blind to the fact others have begun to notice them. Murray notices the two, and notices one of the small adipose on his lap. He slides the slippery adipose against the binding and uses its slipperiness to loosen them. Jonathan turns back to the Doctor and sees him rigging something up. He lets the Doctor know they found everyone and they're with Shepherd. "Let me know when you can distract them or rescue the others. I am almost done." Jonathan worriedly hurries back to the window. Shepherd is about to start with the child, but Pelenore reminds her he's better stock with his specialized memories. He reminds her he lived in the 20th century and that it is prized information and knowledge. Shepherd realizes he is from that era in the past when she was defeated. "Leave the child alone and I am all yours," Pelenore offers. But just as Pelenore convinces her to focus on him, they all turn to the sound of banging on the glass. Missy, impatient that Jonathan has vanished from the window, has banged against the glass in frustration. They stare at her. She realizes what she just did. Murray takes the opportunity to slip from his bonds! Slipping out, he throws the big adipose towards Miss Shepherd to distract her. Using the distraction, Pelenore launches himself over the table to knock two of the starter kits to the floor. Shepherd pulls out a laser pistol from her desk. Jonathan turns back to the Doctor to ask for help, but the Doctor explains he's rewriting the transmat to reach the TARDIS. Jonathan has to help them on his own! Pelenore dares Shepherd to shoot him, the Dandy's most specialized product. But then something is tugging Pelenore back. Turning, he sees it is his clothes! Outside, Missy has whistled. And tugging out of Pelenore's clothing, the umbrella flies out straight towards. It spiderwebs the glass but does not break through. Missy sighs and elbows the glass. Shepherd attempts to fire at Pelenore and he dodges out of the way. Pelenore keeps taunting Shepherd to draw her fire. Murray sees the other adipose is lumbering towards Pelenore. Murray grabs the unconscious child on the ground and makes for the door. Jonathan pulls the door open for Murray as they slide through. Pelenore leaps into Shepherd to knock her back. But then one of the adipose grabs hold of Pelenore from behind. Missy steps into the room, training the umbrella at Pelenore. "Don't worry, I got you covered." A sound emits from the umbrella and suddenly, a vacuum like force rips the adipose away into a tiny version. Shepherd howls for her babies. Jonathan pops the door open and fires into the room to distract Shepherd and the others. This forces everyone to dive to the floor to dodge the incoming firepower. Missy shuts down another adipose guard with her umbrella. A door slams open, and the Doctor tells them the way out is ready! Murray carries the child with him through the room and the Doctor admits he isn't sure where the TARDIS is but the copier will allow them to jump to where it is. Murray hands the Doctor the child and hurries to help the others. The Doctor places the child on the copier and activates it, shunting the child to the TARDIS location. Murray grabs the closest thing to use and snatches a standing lamp. Rushing back to Jonathan's side, they two see Shepherd stays hidden behind a door, demanding they stop or she will have every Dandy hunt them down. Missy tells Pelenore to stop worrying over the adipose, "They're fat. No one likes fat." Jonathan steps into view, revealing his id, and declaring, "Jonathan Blackwood, Hard Target!" and distracts Shepherd enough for Murray to smash the lamp at him! Getting the opening, they hurry to the other room. Pelenore, seeing all the fat in the floor from the adipose, uses it to slide to the other room! Missy laughs and slides alongside him, "Now you see what I was seeing!" Jonathan and Murray see the tiny adipose angrily approaching them. And worse, the employee's eyes glaze over and begin to turn to face them. Jonathan warns Shepherd to stop as he is recording everything. He points to the blinking red light and tells her, "Worse, it is live. Everywhere." Shepherd falls for the bluff, believing Jonathan's lie that his voice recorder is transmitting the feed live everywhere! Shepherd rushes to a console and confirms her suspicions, "You're not transmitting anywhere!" Missy smiles and taps the device with her umbrella, "No.. but he is now." Suddenly the screens are broadcasting everything the recorder has captured. They rush to the other room and the copier is powered up. Missy is shoved in first by Pelenore. The Doctor tells them he couldn't send them into the TARDIS but he could track the device used to trap it, and focused on getting there. Pelenore tells the Doctor, "It is nice to meet you," but the Doctor says, "Meet me? We have met before, Mount Batton." The group transmats to the courtyard. There, surrounding the TARDIS are three golden lions. The group considers the plan and Missy tells them a distraction would be necessary. Jonathan fires his pistol at the lions to grab their attention and hits one of the lions. Pelenore takes his jacket off, waving it like a matador to lure the predators away, but Missy grabs him, "You're too old to buy us time. He's better, he's expendable." Murray, who Missy pointed at, yells, "What!?!" as he hurriedly runs with the jacket in another direction. The rest rush for the TARDIS as the lions chase Murray. The Doctor sees the group running for the TARDIS. Murray digs into the pockets and finds a handful of plastic bricks. He scatters them behind him and the lions stare at the bricks, drawn to the temporal energy in them. The Doctor yells at Murray to keep running then jump. To Murray's horror, the rest have entered the TARDIS, shut the door behind them, and vanish. Murray jumps. He falls down in space, away from the tower, towards the replica earth. The TARDIS materializes to catch him, and both Missy and the Doctor shut the doors with a smile. The group is safe. Emerging from one of Pelenore's pockets, an adipose comes into view. Missy tells the Doctor they're done. Transmissions show all 12 towers are going out as the customers demand their refunds from the Dandy corporation. Pelenore admits he only realized now they are travelling through time. He wonders if they should stop her at the source. The Doctor tells Blackwood it is time to bring him home. Stepping into his office, Jonathan looks around and realizes it has barely been a few minutes since he left. He activates the computer and begins writing his report. Murray and Pelenore give their thanks and suggest he gets a camera. Jonathan checks his device for a recording, but it does not play. The TARDIS reopens and Missy motions, "The other slot. You'll appreciate the visuals." As the TARDIS vanishes, Jonathan discovers his audio recorder now has video recording as well. Playing it, he sees, Missy telling him, "See, I helped you! You can say Doctor Who and her Companion Things have helped save the world." Jonathan still does not know if he can trust her. The door opens and Jonathan sees his boss arrive, congratulating him for a great job. The report actually has already been broadcast, and he's gotten pretty famous. Jonathan asks for a raise and sits down to write more. Elsewhere, the Doctor and Murray walk into his timeline. Murray stretches and smiles, happy to be home but the Doctor seems hesitant. He reminds Murray they never figured out how he got to the future. The answer then becomes clear. They find Dandy:Lion industries labels all around the house. Tearing the barrier open, they see a chamber where Murray's bed should be. Murray is sleeping inside, still cabled into the Dandy:Lion system. The Doctor explains that's the real body of Murray. The company needed to store the memories, and mentally transmitting to the host body standing beside them. "It is time to wake you up. And it will only be dark for a moment." The Doctor opens the chamber and helps Murray get out of the chamber. Murray can barely stand. He can barely speak. The Doctor explains he realized Murray has been strapped into the machine for many many years. Decades. Murray wishes he could see the 80s. Pelenore offers to send him music from that era. Missy offers he can just come over to that time. "Although there will be rules," the Doctor admits, "This isn't like sending a kid to the grocery store." Pelenore goes to Nina, who isn't quite sure how to handle the time travel. The Doctor opens the door and asks them to step out as it is time to go. Pelenore offers to Nina to visit the library whenever he wants. Pelenore asks if this is also his time, but Missy tells him she's handling returning him. The Doctor looks at Missy, but she shushes him. Pelenore pulls out a library card and hands it to Missy, telling him to use it next time. Missy thanks him for treating her more than as some villainess, cackling in the night. Pelenore tells her she is more than a villain. She asks if he just told him something nice, but the Doctor tells her to stop. She sighs, muttering about missing disintegrations. Sending Pelenore off, the Doctor thanks him and tells him that this wasn't meant to be part of his experiences, but when Pelenore offers to tell him about why he became a librarian, the Doctor admits they've had that discussion before. In the background, Pelenore hears a voice saying the library should be the place she visited before. Turning, Pelenore sees an old woman come into view with a red-haired young man. The old woman greets Pelenore and she introduces the young red-haired man to him, "This is the Doctor," the old woman explains. When Pelenore introduces himself as a librarian, the red-haired doctor grins, "I always wanted to be a librarian! Tell me more. How did you become a librarian?" The old Nina watches as the two walk away. She smiles as she sees the adipose on the ground nearby, waving at her. Alan Bahr shared tremendously kind words about my role in Cold Shadows and I truly am appreciative of his support and appreciation of my work. Listen in and check out what we have in store for you all in the games we have planned. Thank you, Tabletop Radio Hour! 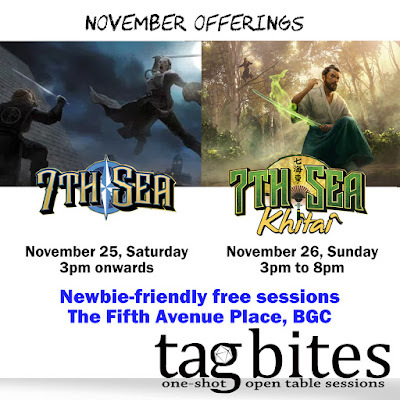 November TAG Bites sessions done! 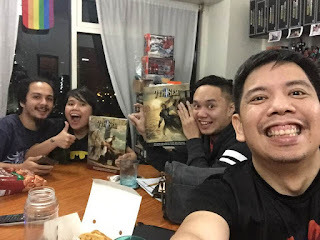 Was able to run two TAG Bites sessions this November, and the game of choice was 7th Sea second edition. While Rocky was on a trip to Singapore, I had a few adventurous souls to join me on another romp across the swashbuckling adventure-filled nations of Terra. 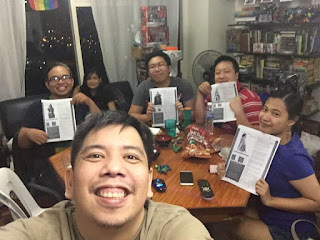 Another successful and exciting TAG Bites one-shot session of 7th Sea! Thank you for playing, awesome people. Adrian, Arianne, and Miko were members of the Rilasciare who were tasked to locate and retrieve an intercepted letter before it reaches the hands of L'Emperuer. From pretending to be lovers, to convincing brute squads to act against their leader, the game ended with a porte sorcier nearly being savaged by a crippled horror. The players even got a glimpse of the intimidating Imperatrice, who defly used her Sorte powers to remind the heroes who is in charge. The heroes have successfully appeased the Kamuy of the lake and cleansed the town of the terrible monsters that have assaulted the fishermen. And yes, Always have Joy in your hearts! Or a Bear. Lawrence, Daniel, Chester, and Che portrayed a travelling band of friends who happen upon a small town harrassed deadly swallowing monsters and a displeased lake. Who would have known the tragic story would lead to the heroes being uncertain who deserves to truly be punished for their failings. 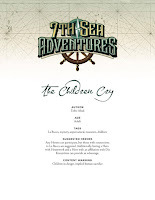 I still have some reservations about the changes applied to 7th Sea: Kithai. I feel some of the "Virtue" traits might best be merged together, and certain new ones be added to replace them. But the new brute squad rules feels definitely fun. Til the next TAG Bites session! Sir Perriton visits Imber again, having hoped to find the family whom he promised to purchase a cow from. Instead, he discovers that the Church presence nearby has caused some conflict and there has been a disappearance in the number of women in the area, including the mistress who used to live with Old Garr. Bliant, on the other hand, begins to court Lady Gwiona, visiting her when he has opportunities to do so and spending time with her at the garden when they are together. Slowly a new Passion grows between them. Court is held at Windsor. There is much talk about raiding Colchester. Sir Gilmere and Sir Riordan encounter the strange man, Merlin, who seems to be anxious to eat. Rumor has it, he has been fasting for nearly half a year for reasons he cannot divulge. He ends up warning Gilmere not to be "distracted by the goat" and is ushered off to discuss with the Earl the plans for the Colchester raid. But despite the excitement of the new knights to be part of the engagement, they learn they are given garrison duty to watch over the Countess Ellen, Lady Jenna, and the unexpected guest, Lady Gwiona at the City of Sarum. While there, however, they begin to hear a goat yelling somewhere. As the group investigates, they find an old man in tattered goatskin asking the knights to help find his missing goat. The group splits up and while the rest of them consider what to do with their squires, Gilmere tracks the goat to the top of the hill. He fails, however, to see the nearby threat. 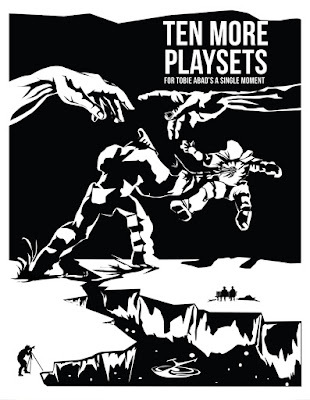 When the giant emerges from the shadows, the knights suddenly find themselves in a fight for their lives against a frighteningly powerful monster! The giant, it turns out, was merely a test from Merlin who needs knights to protect him in a mission of some sort. The group fights against green knights who bleed water, and do what they can to fight against these nukalaevee from reaching Merlin. The wizard somehow has drawn a sword from the lake. He thanks the knights for their service to Britain and sends them off to return to their duties. The knights share their tale with the Countess Ellen and she eventually shares it with the Earl during the Christmas Court. This brings them more glory. A young lad seeks to become a knight and gain ownership of the land he and his mother live in. Gilmere and Bliant speak with the boy and knowing the Countess needs to reach her destination soon, Gilmere takes the boy to serve in his household and eventually pens a letter for Aramig, the boy, to become the squire of his younger brother. Aramig gains a Passion (Hate) towards Bliant, whom he feels was insensitive to his plight. Bliant continues to meet with Lady Gwiona, and their Passion for each other begins to grow. Along the way to Wylye, however, Riordan and Perriton encounter some trouble at a farm where a foreigner supposedly is causing trouble. The man, Finnegan, turns out to be a "Bear Killer" and has come to challenge the supposed "Riordan Bear Killer" to an arm wrestling match. Finnegan leaves defeated, but gains Passion (Respect) towards Riordan. Riordan begins to join more tournaments, gaining the title, "Riordan the Giant". Perriton spends more time with the young Lady Jenna, whom he shares more stories with. On Christmas, however, the feast is remembered as the Great Sword Feast. The Earl and the Countess are surprised to learn that King Uther himself and his entourage have opted to join them this Christmas. Countess Ellen, however, maintains a calm level of focus and guides her staff to accommodate the royal guests. Gift giving soon follows, but nothing prepares the gathered for Merlin's gift to the King, Excalibur, the Sword of Victory! Merlin, however, reminds him that all he need to, however, is remain just. 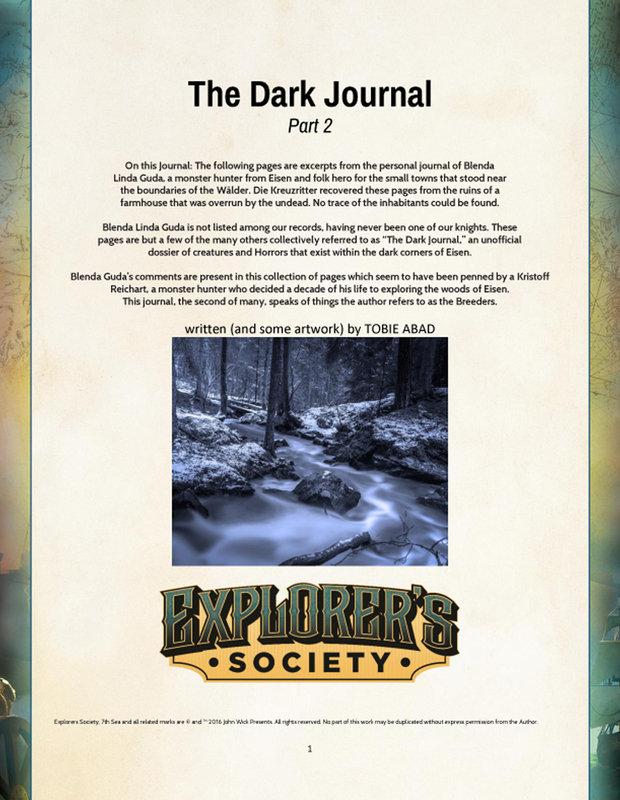 Merlin invites the knights to share their stories of how he helped them and this leads them to making a choice: Join the mission to raid the Saxons up and down the shoreline, with the plan to destroy as many of their boats as possible. Or accompany Earl Roderick, King Uther, and Duke Ulfius, to ride to the Duke of Lindsey at Lincoln. The four knights opt to break into two groups to take part in both. 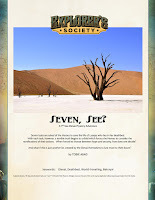 Riordan and Perriton join the Lindsey Embassy and while waiting for the missing Duke, opt to go hunting. While hunting, however, they encounter an unexpected sight: a creature with the body of an antelope, but with two horns that can be independently moved. The beast is a Yale, and Merlin stops them from attacking the beast, warning them that to attack such a beast would be to invite trouble in the future. The Assembly finally happens and the two bear witness to the Duke of Lindsey submitting before King Uther after Merlin shares the High History of Excalibur and reveals the blade, dispelling all the shadows in the gathered. Gilmere and Bliant, on the other hand, gain more Glory as they destroy ship upon ship with the guidance of Prince Madoc, son of Uther, and the Admiral Gwenwynwyn. They destroy ships near Pevensy, then sink the ships of King AElle. Then they go to Dover and sink the ships of Jutes. But as they sail up the Blackwater River, they learn that few ships are present and suspect a trap. So while the two man ships to lure the Saxons, the rest of the ships under Madoc and the rest finish the job even past Yarmouth, and into the lands of Lindsey and the waters of the Wash.
King Uther is in a better mood by the end of the year. He sends spies and nobles to learn more of what the northern lords in Cumbria have in mind. November offerings for TAG Bites. Only four seats per game available. 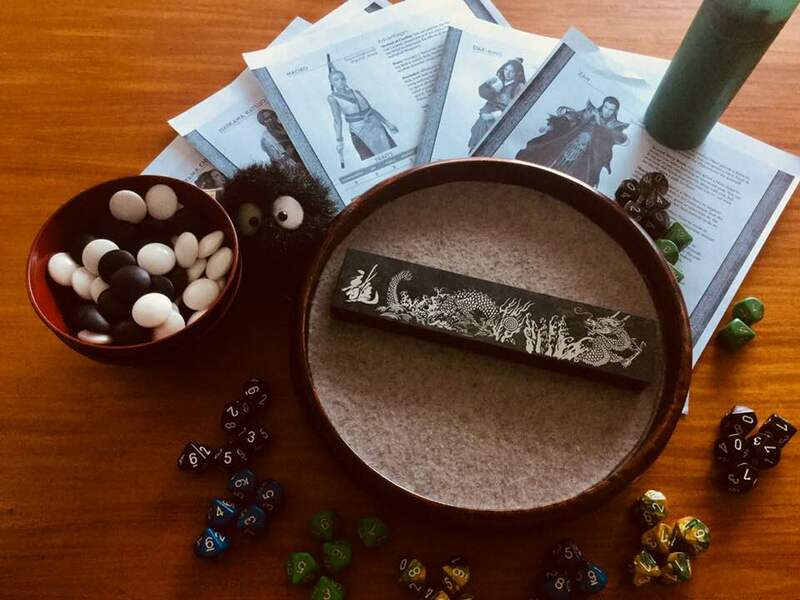 They are completely free one-shot sessions where you get to try games you haven't tried yet, or try games that aren't commonly run elsewhere. Learn more about them here. Interested in grabbing a slot? Be sure to reach out and let me know asap. I've been working on the text for the upcoming Deluxe Edition of A Single Moment, which I've lovingly entitled, A Second Moment. One of the big changes I've decided to embrace in the game is the use of a sheet to track the Chapters, Key Characters, and Scenes, and Edges, Hatred, and Scars. This is called the Hamon Sheet. The Hamon SheetHamon literally translates as “blade pattern” and refers to the visual marking the blade that was created during its smithing. The look and pattern of this outline depends on the hardening process the metal undergoes as clay is applied to it prior to cooling. The term seemed appropriate to name the sheet that tracks the relationship between two Samurai as their friendship cools and their conflict sharpens to a razor edge. Here's the link to the JPG file in case you want to start using it in your A SINGLE MOMENT games! So I am sitting here at my six-sided desk, wondering how to capture the feels and emotions of the last few days into a single blogpost. I feel like I am standing here, facing my blank blog page, staring at it and knowing in the end, one of us will have to give up. And I know it will not be me. TAG Sessions was invited to be part of the Electronic Sports and Games Summit this 2017! 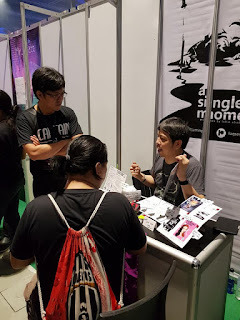 We were given a booth and the opportunity to reach out and interact with people, both gamers and curious passersby, and share with them information on my various narrative tabletop role-playing games. 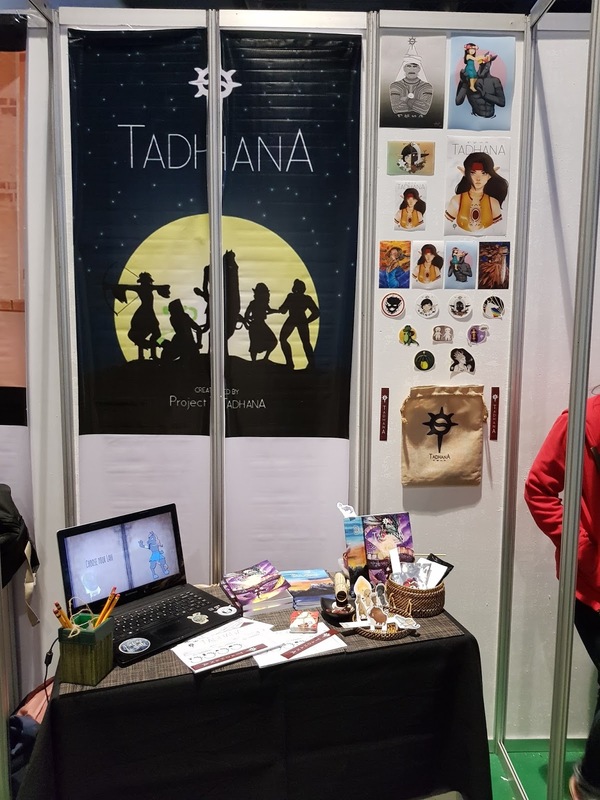 The convention ran from Friday to Sunday, and each day was a day filled with lots of wonderful moments. Friday had my awesome bud, Urim, with me. The very guy who asked me to try writing up the game system after way too many game nights where other gamers were absent due to real life priorities. Saturday and Sunday, however, Rocky was able to help me out and it is thanks to him that we have all these wonderful photos to have on the blog. On the first day, I was able to run two demo games of A Single Moment. The key memorable moment was a game I ran with a young player named Justin. Justin opted for a story of two Samurai who were at odds because my Samurai (Ichi) was always jealous of Samurai Justin's intelligence. The focus of our argument was this book which held the secrets I wanted to learn. But when I got it, I couldn't read it because it was more like a puzzle book. So we ended up fighting and the fight lead to a spectacular exchange at the mountain edge. My attempts to shove him off the edge failed thanks to his spiked shoes. He then leaps behind me, catching me by surprise, to push me off the edge. Samurai Ichi wakes up. It was just a bad dream. And he realizes he needs to be brave enough to ask Samurai Justin for help if he really wants things to get better. And so, the story ends. It was A Single Moment of Courage. Talk about an incredible story, eh? And Justin was behind most of it's creation! 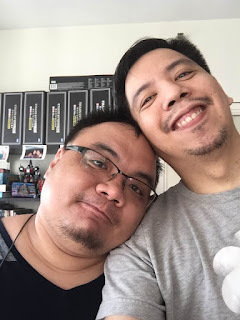 I ran a few more demo games in the other days, but the next most awesome one was the game I ran with Jaoq. We had a story of Mercy with a Samurai mistreating a Clanless Farmer who had once been a Samurai. When my samurai is beaten up by bandits, it is the Clanless Farmer who defeats the bandits and carries my weakened body back to my Daimyo. There, however, I lie and claim the bandits were weakened before the Farmer came to help out. The Daimyo, however, sees the truth in the Clanless one's words and makes him the bearer of the Clan Sword. Years later, when the opposing Clan which the bandits were part of attempt to ambush us during a journey with the Daimyo, the Daimyo is injured by an arrow neither of us notice due to our focus on arguing with each other. This leads to us fighting each other as we BOTH believe we are acting with the demands of Honor in mind. The Clanless Samurai, however, is handicapped, as he refuses to draw the Clan Sword, which he knows to be a Sword of Peace. In the end, he manoeuvres skillfully enough to sever one of my Samurai's arms and force me to surrender. I nearly kill the Daimyo in my rage, but the Clanless Samurai saves him and leaves me to weep in the pouring rain. And as an Epilogue, the Clanless Samurai leads the march of the Daimyo in the festival. And my one-armed beggar now watches from the alleyway, vowing revenge. Thankfully, the games were all a success. 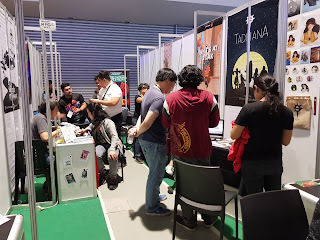 People enjoyed playing them and more were curious enough to ask about my other games. 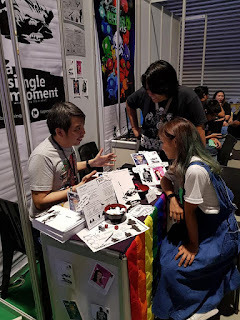 There was a lot of interest in my drag queen Fiasco game, Sickening Queens, and a few excited responses to That Night Out, my survival horror indie game. There were a bunch of interviews as well, with Quit Stalling and GMA News being the big ones during the event. I met Pam from Girls Got Game and sadly I was eating when they passed by, so the offered to come back when I was done. 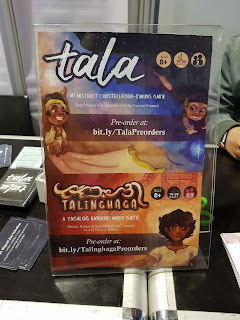 I directed them to instead try checking out my awesome neighbors: Project Tadhana, Tala, and Talinhaga. I hope they all find a chance to get more milage. In the end, there was a lot of emotions and intense feelings in the air. Almost like we were friends for years, there was a bittersweet tinge as we said our goodbyes and disassembled our respective booths. There was the immense gratitude for being given a chance to share our works and a sublime joy in knowing we have found new friends. 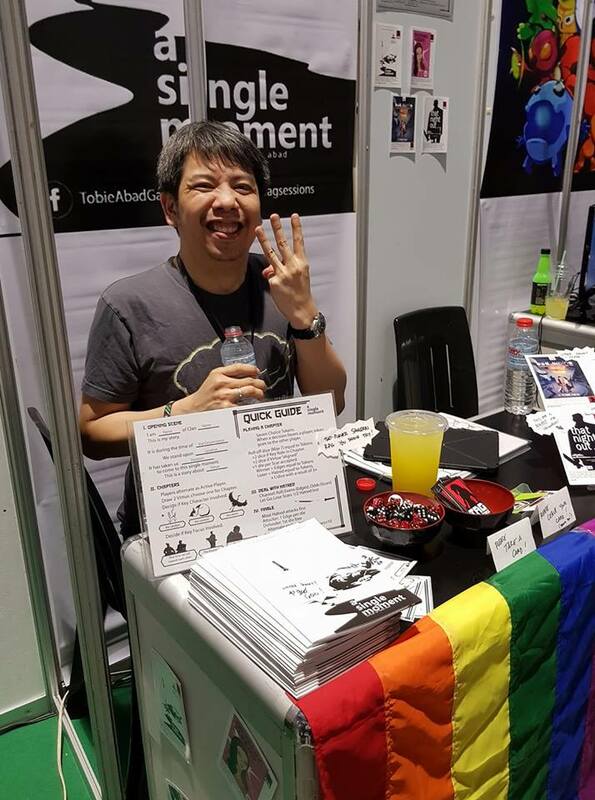 Thank you to Pen Gwen, James Lo, and to everyone else behind the ESGS for having us and allowing our humble works to be part of the event. Thank you to our muses and inspirations. To those who gave us that creative spark to make our works. Who gave us the desire to give birth to such creations. To everyone who wanted to pass by and say hello. To everyone who wanted to try our games. 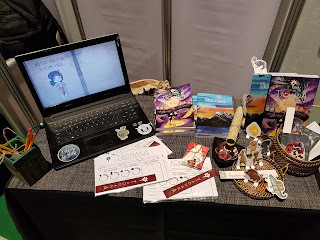 To all the curious and the excited people who tried our games, or asked for more information about what we loved doing. To our supporters, friends, and family, who continue to give us the fuel and strength to keep going. Sharing one's creations can be terribly frightening, and you all have given us the courage to keep going and to be proud of what we have achieved. Thank you so much. Thank you. So in many ways, the ESGS was our Single Moment. At least for that month. See you all again soon, I hope! 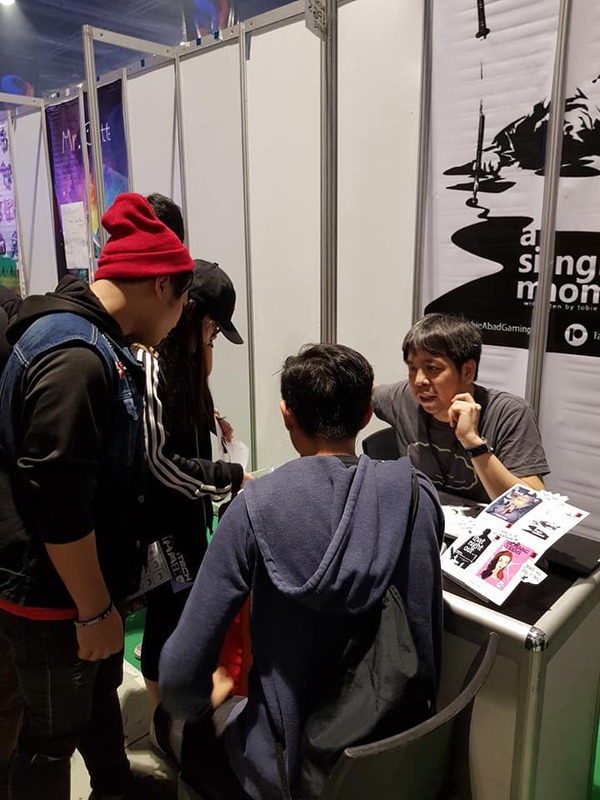 The wonderful people of ESGS have invited TAG Sessions to have a booth in the Indie Arena for this year's Electronic Sports and Gaming Summit (aka ESGS)! 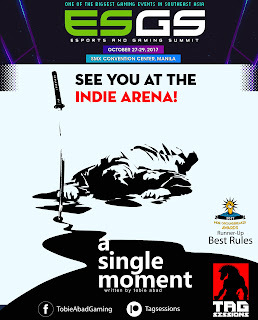 The ESGS will be held at the SMX Convention Center beside Mall of Asia this October 27 to 29. 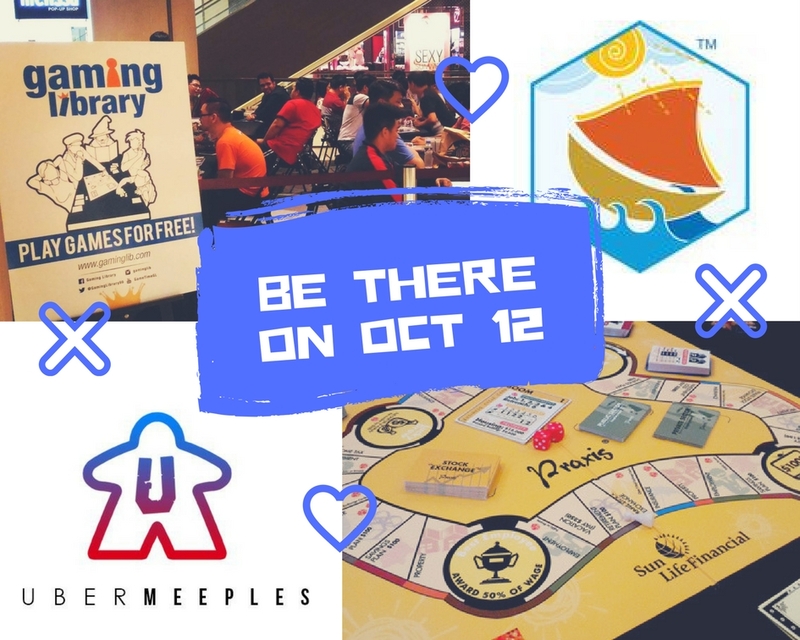 Other than TAG Sessions, a host of other tabletop games will also be present including Project Tadhana, [Hugot], and a bunch of other games! "Will you embrace your hatred or uphold honor? A Single Moment will be among the many awesome games featured this weekend at the Electronic Sports and Gaming Summit. 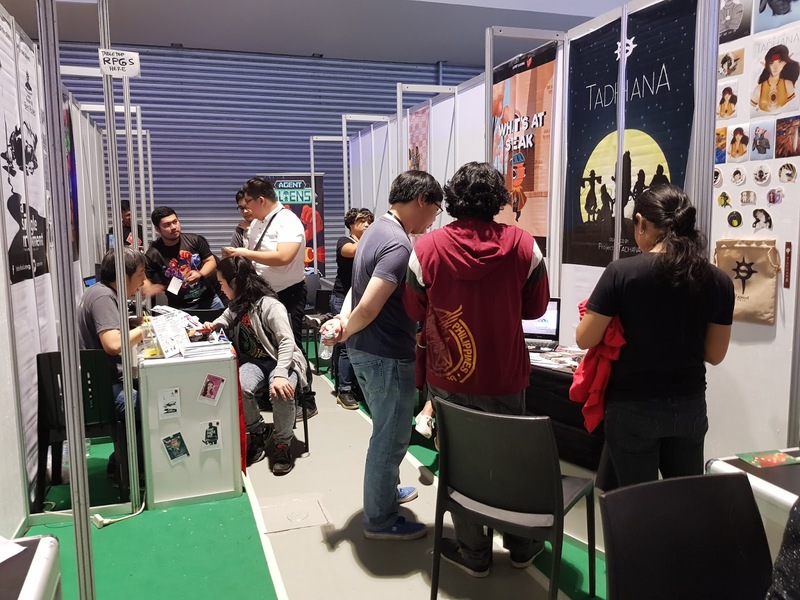 Play our our two-player tabletop role-playing game and a lot of other indie games at the Indie Arena! 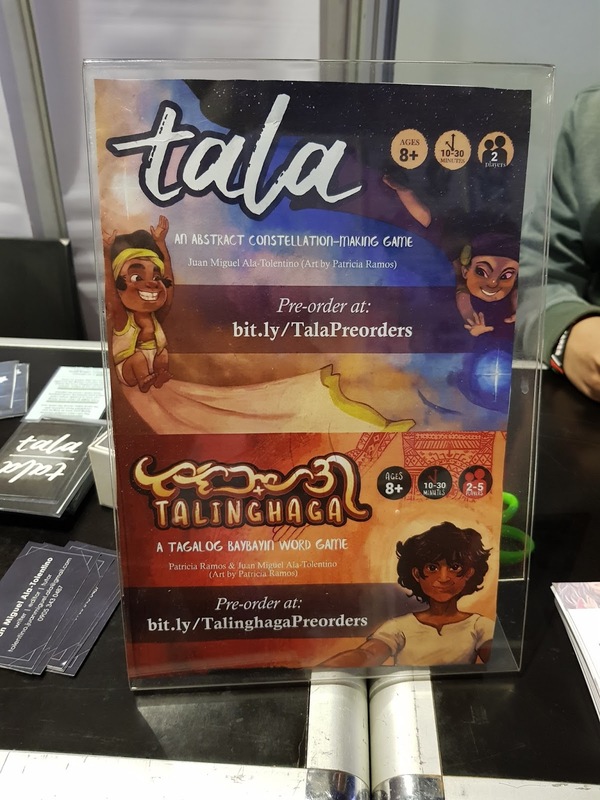 TAG Sessions will be at Booth #09"
I've been printing out "postcards" of the book cover of my PDF stuff so people can still learn about them despite existing only in a digital format. Also got my calling cards sorted out, with the new TAG Sessions logo design provided by my tremendously supportive publisher, Gallant Knight Games. I'm hoping people appreciate the local touches in the look. 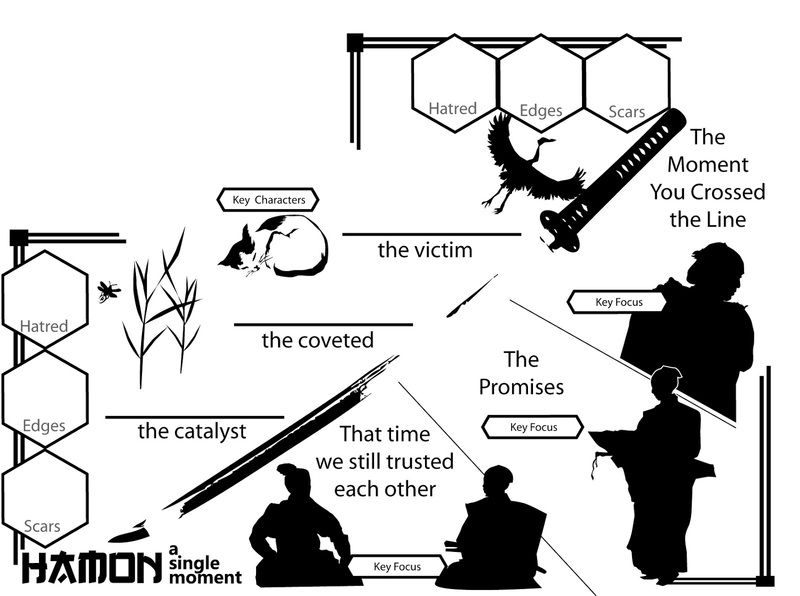 Finally, I've prepped the "demo guide" which shows the steps of the game, the upcoming HAMON sheet which will be part of A Second Moment, the deluxe edition of A Single Moment, and three Virtue Sheets for the impromptu demo games to show how the system can be used for Samurai battles, but can also be used for Space Opera stories and Romantic Comedy tales. Rocky will be joining me on Saturday and Sunday at the booth. Oh my gosh, we have a booth! Last year, I attended to give a talk. This year, we have a booth! Here's hoping people check the game out! I was invited last October 12, 2017 to give a talk on tabletop games, and how it makes one's work-life better. Manila COE was celebrating its 2Berversary which included the launch of their tabletop group, UberMeeples. 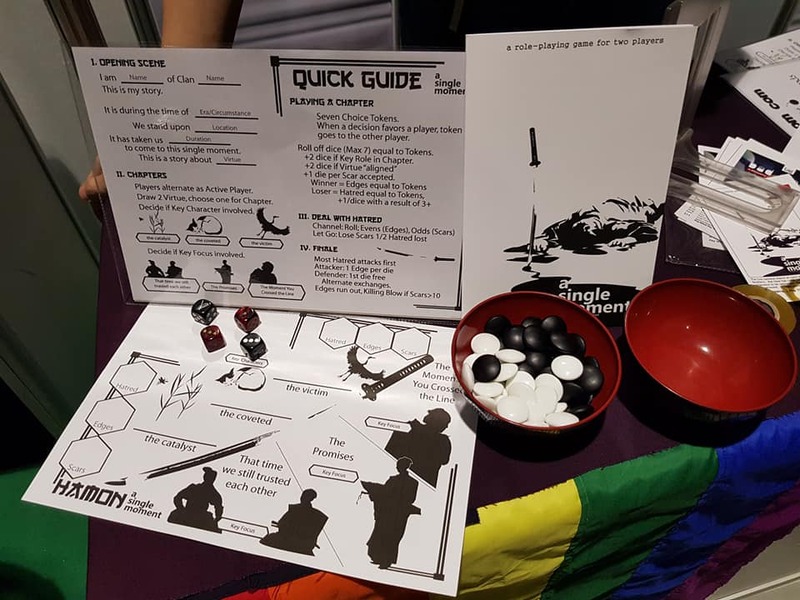 So I prepped a talk on how playing games can give you a lot of learnings and prepare you to handle things better both at home and in the workplace. What started as a slideshow for a one-hour talk, however, needed to quickly be edited down to its focus points when I learned later on the talk had to be shortened to a short speech instead! Thankfully, I was able to manage and adjust a day before the event itself. 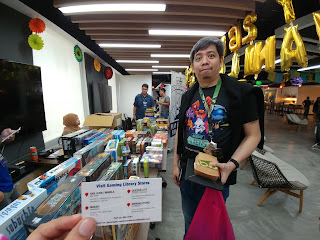 Gaming Library was present there too! Me and my colleague and tremendously supportive friend, James, who was there to offer moral support and to take some photos. Me giving the talk before a gathered group of interested gamers, plus a larger room of hungry and curious onlookers. It was like a TED talk on gaming, admittedly. I should post the slides for the talk online soon. 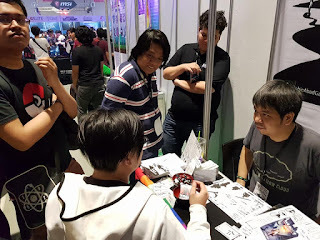 Me saying hello to the Balangay Entertainment booth, who made the pretty fun Mars Ravelo's Darna at ang Nawawalang Bato card game. Very fun game! I highly recommend it, more so with it's budget-friendly price! 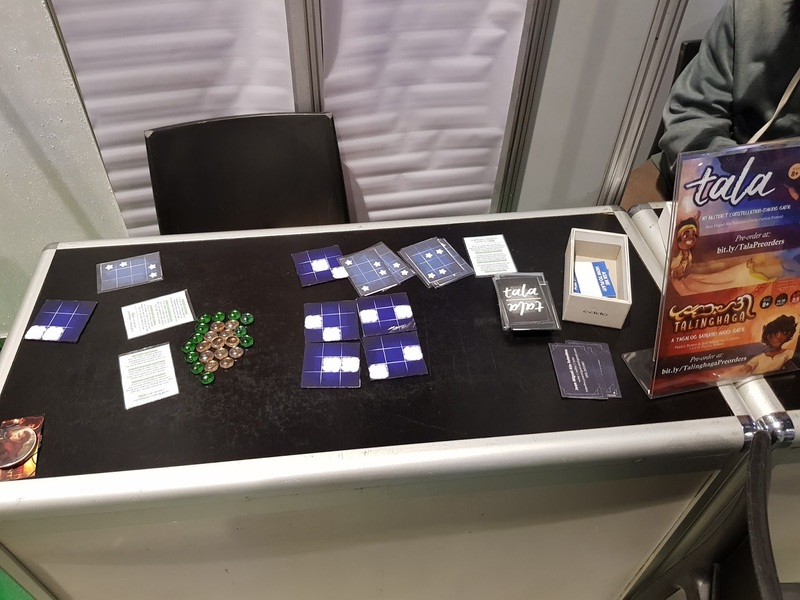 A peek at the Sunlife money-management game, Praxis, which plays sort of like a combination of The Game of Life and Monopoly with a trading market, various employment occupations, property, and insurance options! One of my two friends who invited me over. 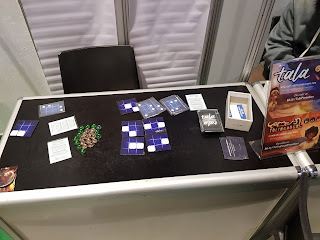 In the background, I can also see two supporters of my other game, A Single Moment. Thank you again, Marvin and JP for having me over. Thank you to the Gaming Library people for keeping my company while there too. And thank you to Jonas "fudgebob dicepants" Susara and daughter, Serene, for the love and support. 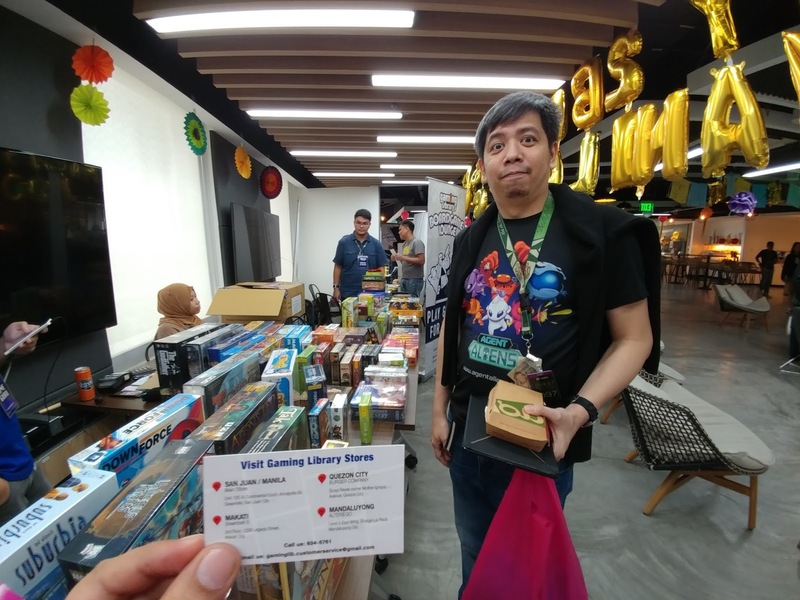 This was Marvin's pic of me at the Gaming Library area. So many fun games! After years of wanting to someday have the guts to run a Pendragon campaign, I've decided to take the plunge. Joining me in this journey are Rocky, Adrian, Flip and Urim. I have to thank Alan Bahr for always encouraging me to do this. Flip plays Riordan, a Trusting knight from Pitton. His father, Jordan, died of mysterious circumstances back in 466 while serving under Aurelius Ambrosious who held up the Pendragon banner. His grandfather, John, was killed by Pictish raiders in 440. Adrian plays Perriton, a Prudent knight from Steeple Langford. His father, Perin, died while in the service of Uther in 480. His grandfather, Peregrin, still lives a ripe age of 75 with his last battle being the Battle of Kent in 457 under King Vortigern. Rocky plays Gilmere, an Honest knight from Shrewton. His father, Gilbert, passed away from natural causes in 472. His grandfather, Gerin, died in a raid in 442. Urim plays Bliant, a Chaste knight from Berwick St. James. His father, Berel, died in the Battle of Windsor in 473. His grandfather, Belias, was killed in a raid in 443. Episode 01 explores the four soon-to-be-knights as they first undergo a training session under Sir Elad, who has them undergo Quintain Training, with all save Glimere falling from dodging the rocks that were to strike them in the chest. Afterwards, they were invited to Race and in the race, Gilmere ranked first, followed by Riordan, then Bliant, and finally Perriton. As a final part of their training, the four were then invited to take part in a Jousting challenge, and in three rounds, Roirdan and Gilmere ended the challenge in a draw. Sir Elad then asks of them to take part in a task for the good of the country. The four travel to Imber to deal with what may well be a man-eating bear or wolf. They are tasked to find Old Garr, a healer, who will help them fulfil the quest. The group's journey to the village at the bottom of a valley allows them a brief glimpse of Stonehenge in the distance. At Imber, they meet Garr and his mistress, whom he is living with in sin. The soon-to-be-knights are a bit perturbed by this, but focus on their duties. They begin the hunt for the bear as soon as morning comes and the hunt stretches for a few hours. It is by noon that their hunt begins to show signs of the trail. They find the bear, and while Perriton is trying to motion directions, Roirdan does not hesitate and breaks into a charge! The dogs with them rush forward, to distract the bear. Perriton yells at them to go for the mouth, as he prepares to go for the leg. The massive bear fights back viciously! Gilmere, in turn, hears strange sounds that draw his curiosity. He sees a creature, unlike anything he has seen before: head and neck of a snake, body of a leopard, haunches of a lion, and the feet of a hart. And before he could say more, the beast bounds away and almost immediately, a mounted and armored man crashes through the bush, searching for the beast. Gilmere only recognizes the crest of the man to show he is a knight of the de Galis clan. He asks Gilmere if he's seen, "the Glatisant" but leaves without offering more information. With the success of the kill, the bear is skinned and its meat is shared by the village. On the group's journey back, however, they encounter a group of bandits that have assailed a farmer and his daughter. They dispatch of the bandits quickly. Perriton promises to return and pay them for the cow, but he remembers they have a mission and his focus has to remain on it. They return to Vagon and there Elad suggests they visit the earl to share their adventures. They arrive at Sarum and there, they meet the Earl Roderick and his wife, the Countess Ellen. After a brief series of faux pas, the Earl introduces them to the gathering and they find themselves making a few new acquaintainces. The death of the bandits is deemed just and the coat of the bear is received well. They are fascinated with the story of the Questing beast as well. Perriton shares the story of the fight against the Bear and even crafts a chant/rhyme on their battle against the bear. Perriton is asked if the bear became a man, and learns that some bears supposedly turn into men upon death. He is told to speak with Sir Ameg of Tilstead, an older knight who has had numerous experiences in his life. A veteran of many battles. Perriton bonds with Lady Jenna, the Earl's daughter, whom he promises to take note of tales to share with her in the future. His stories gain the eye of Lady Elaine, a woman whom other ladies do not hold in high regard. Father Tewi, on the other hand, notices Bliant, who commends him for being a man of honor and faith. He asks Bliant why he has not been married yet and recommends he consider Lady Gwiona, a woman with a blank handkerchief in her hands. Her husband recently died after proposing to her. He also recommends Lady Indeg, if Blaint is not seeking beauty but roots. She is the richest heiress, widowed twice, and is lonely. "Would you choose beauty or comforts?" Bliant admits he would rather choose Gwiona to comfort her for her losses. Gilmere speaks with the Bishop Roger, the Bishop of Salibury, and learn he is well educated and curious of the stories of the Fair Folk. He believes the world can benefit from greater learning and fears to dispel. 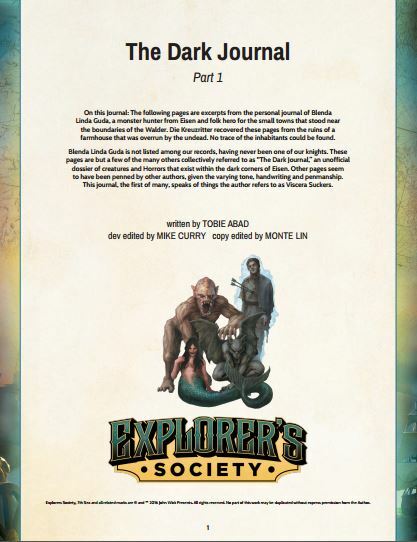 He asks Gilmere to share an account of the creatures he encounters to document them in an illuminated tome. Gilmere admits he isn't certain he's comfortable with that. Sir Jarren wraps his arms around Gilmere from behind and tells the Bishop that was the Pagan way of saying one is not interested. Gilmere knows Jarred to be a skilled and ambitious young knight and the best swordsman at court. He points out how Lady Adwen, who has been glancing at them, now believes in the Fair Folk since the "honest" man has spoken of them. Gilmere is asked to give her a small wave. She looks away, shy having been bested in a wager and now owes Jarred a kiss. Gilmere honestly admits he would not wish to participate further. Jarred admits he seeks never to be wed, "I am legend and legend shall end with me." Riordan is gambling with some other people, among them a banneret knight, Sir Hywel, playing backgammon as they talk about the ferocious bear. "Not as horrible as the manticore, however." Sir Hywel's wife used to tell him about those stories. His wife, however, died, giving birth to his daughter. He asks Riordan to consider his daughter, who is still 9, but worth considering being the fir wife to Riordan the Bear-Killer. The four are then knighted, and they are asked to join the Earl for the Vigil. Everyone is dismissed and are to return by the morrow. The four accompany him to the Church and there they try to remain awake long enough for the vigil. Perriton nods off in the Vigil.The Earl wakes him. The Vigil continues. With the come of dawn, the ceremony reaches its zenith. They speak their oaths, they are given their arms, their sword, and their spurs, and to close, the tradition of the Leap is celebrated! The groups are told to rush forth, and leap at a single bound upon their horses. Riordan is maddened by his passions and he breaks into a run for the backrooms. Gilmere leaps successfully and lands on the horse's saddle. Bliant leaps and successfully lands as well. Perriton hesistates, but then feeling disheartened by his emotions, he charges forward but somehow he still lands upon the horse, despite the cheers of the people. The three turn and stare at the lone horse, wondering what happened to their companion, Riordan. Ellen leaves the Earl's side and searches for the missing knight. As the night stretches on, the three are the center of attention in the gathering and are unable to separate to look for the others. Riordan is lost in the many hallways and corridors of the castle, shameful of his failure to do the Leap. He turns to the sound of footfalls and he slips into the first door he can find to hide behind. Closing the door behind him, Riordan hurries down the steps and it takes a bit of a while before he realizes there is a fog in the chamber. The steps he walks upon glow from within. There are rocks, like gigantic crystals of salt, all around. Inside are silhouettes of winged horses, serpents, and other figures. A figure comes into view, who turns upon realizing his presence, addresses Riordan with his hands raised in the air as he holds his staff high. "You! It is too soon for you to be here." In an eyeblink, Riordan is back at the hallway. He can still remember the man's burning eyes. Countess Ellen finds him and helps him to his feet. She tells him the others are worried and that he has been missing for almost a week. Riordan is puzzled. It still feels like the same day for him. Months pass. With the absence of Merlin, supposedly from helping King Uther win a victory in the Battle of Damen, the knights are soon called to join the Battle of Mearcred Creek in Sussex. The Knights gather as a unit lead by Sir Amig, but then are assigned to lead their own company of men for the fight. The battle against the Saxon footmen is violent, with Bliant a few times separated from his companions. The battle rages on despite Uther's superior troops, and in the end, the knights not only successfully route the Saxons, but have successfully captured as well a number of Saxon's key soldiers. The mood of the Christmas court is gloomy. Despite the standoff in Sussex, the Saxons gained a victory in Caercolun. Earl Roderick, pensive given the events, urges his new knights to practice hard at the arts of war. "This is no time for poetry," he says. The bartender slams down four drinks on the table as rain is pouring outside. 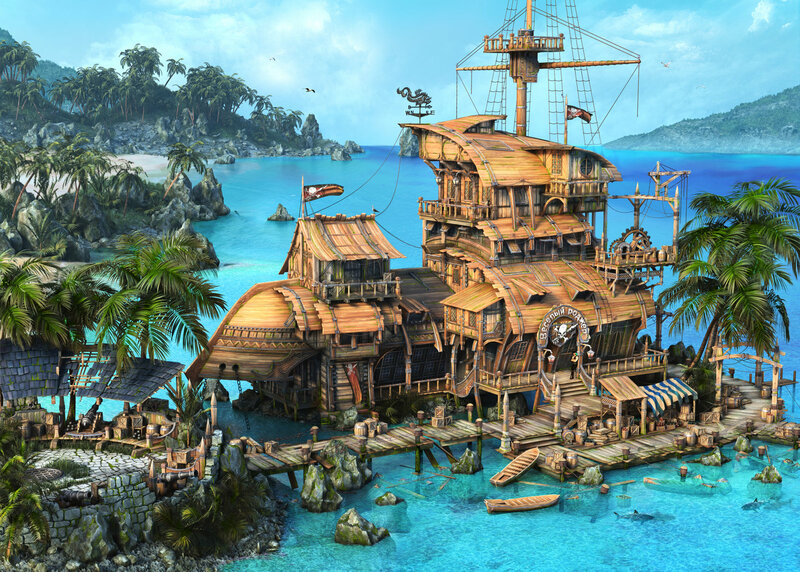 The group is at the Widow's Nest, a small island with a town on it southwest of Montaigne, primarily for piracy. Having just landed, the four sit at the bar and share their stories of the recent events that transpired. There is no one else in the bar, save for the bartender, Greg. 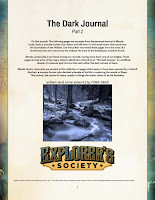 The group is exhausted from an encounter with Delacruz, a ship captain. The group has a brigantine ship named Sophie, one owned by Teofel Lucja, the Sarmatian Zynys who is skilled with dueling. Gabriella, the Strega, downs the drink in one gulp. Alberto McEntyre gasps, musing he just has fallen in love with Gabriella. Teofel asks for more drinks as Greg asks them what happened. Agosto Baltasar Carlos Domingo y Esteban remains silent at first. Teofel shares they barely just escaped from an attack. Alberto counters at the idea that they barely escaped. Greg notices Teofel is the only one with a hat and assumes he is the captain given his "pirate-y" hat. Agosto finally speaks up, saying the "woman" speaks the truth since the rest of them were not having trouble. He shares they had a long day waiting for the ship they hoped to target. But "someone" had failed to make sure the ship was not fully armed. They argue about the fully armed ship and lost most of their other men. Only the four of them and a few other able seamen are left. They ask why the bartender is so interested in them, and the bartender shows there's no one else in the place. Agosto rattles question after question at the bartender, and finds joy in how the man finds the questions confusing. Agosto explains he calls Alberto a "woman" and Gabriella a "man" because Alberto complains a lot and Gabriella can take care of herself. Both Alberto and Gabriella glare at the man for his blatant sexism, unawares of his former history as a priest... and an Inquisitor. When Greg hears the ship they attacked happened to be an Atabean Trading Company ship. He asks what sort of cargo it carried and this draws Gabriella and Teofel's curiosity on why the bartender would be so interested. The group is still getting used to working as a unit especially since Alberto joined the crew in hopes of inspiring the others to start acting more like honest men than pirates. As the group talks, Agosto stands up and heads for the kitchen. Greg hurries after him! In the kitchen, Agosto uses his alchemical skills to "fix" the beer Greg has been serving to become something far more palatable. Greg begs to be given the secret formulae and Agosto asks Teofel to make a deal with the man. "The place as a freeport for their operations, and in exchange the beers will stay as lovely as that." Greg insists the bar is a good place and the only reason there are no customers is due to the rain. Teofel quietly calls for the rain stops, "What rain?" Greg imagines the room being more active and agrees to the deal. Time stops. The dievas talks to Teofel, unhappy that he's making deals without consulting it first. It admits it needs Teofel alive, but it would prefer he considers its choice on the matter first. "I have such good plans for you," it grins and time starts once more. When Greg asks about the cargo again, Gabriella reminds him she doesn't like his interest in the cargo. She warns him she can "read" him and Agosto even warns she is, unlike most Voddacce women, actually able to read. Gabriella ignores the backhanded compliment. The bar is the Salty Pig. They were about to get the cargo but Alberto forced Gabriella and Agosto to the side, dropping the cargo into the sea. Alberto, however, insists they shouldn't have attacked the ship. Gabriella questions why they chose to let him join them. Agosto shares how his former faith used to speak of how people are given a role in life and should just choose to accept it. But now he believes in the need for people to choose what they want. He wonders if Alberto sees them as a mission. Alberto insists he will be helping in his own way, but he cannot go against his tenets as a Glamour Knight. Greg serves them more drinks, with Gabriella asks for three drinks all for herself. Outside, a heavy knock announces the arrival of the Atabean Trading Company as a Captain Delacruz arrives to drink at the bar. The same man they had just pirated. On the same island. Agosto tells Greg to let them in and has them leave the weapons at the table close to the door. When the Captain's men insist the Captain never leaves his weapons, Agosto steps out to talk to them, shows his Vaticine Church symbol and claims as a priest he must insist they leave their weapons. 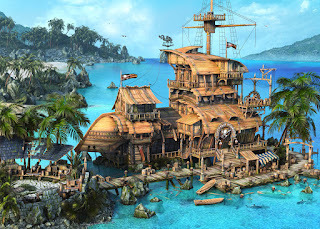 The Captain wonders why Agosto looks familiar, he laughs that all Castillian's look like and quickly turns away. A lean man enters with a tri-corn hat, with one hand on his waist. Delacruz. The same man indeed. While Augusto tries to distract the man and show them to a room to drink, the others attempt to dispatch Delacruz' men and deprive them of their weapons. It takes Gabriella's beauty and Sorte to disable Delacruz and when the fight reaches the outside of the ship, the group opts to storm Delacruz' vessel for the "treasure" they have on board. The treasure, they discover, is a young figure chained in the brig. With the figure, as it turns out, is a dog.